Yesterday night around 10pm, we finally left San Diego Harbor for what we hope to be the last time in a very very long time! The sea was very calm and we had almost no wind so we decided to motor to try to gain some time on our fellow Haha buddies! The night was uneventful with only a few cruise ships in the horizon but never close enough to be a threat. The sky was full of stars and it was quite entertaining to watch the numerous falling stars. A nice night to be out of sea! Today has been as quiet. Not much to report. We sailed all morning with our spinnaker at about 3.5 knots and are back to motoring some as the wind has totally died down. The sky is clear, the sun is bright and the waves are lazily rolling under us. We have not seen a single boat today and we can't see land either! It is quite the exceptional feeling! Grace has kept herself very busy. Morning was spent coloring boats and sea lions on her portable board, and then she took out all her baby stuff and we had a real nursery in the cockpit complete with doll crib, changing pad, doll stroller, and many many babies to care for! After a good lunch and some lego constructions with papa, it was time for a nap! Poor papa must have been as pooped because he fell asleep as fast as her! It is a good day indeed! Monday, we watch as our fellow Haha boat buddies left San Diego Harbor at the official beginning of the Baja Haha Rally 2014! We had to stay behind because on Tuesday I had a very important appointment that I couldn't miss but was enable to move to an earlier date! As many of you know, in May I filed the paperwork to become an American citizen! We had thought that 4 months would be plenty of time for them to process everything and give us a interview date as my case is very straightforward! I ran to the mail everyday for those 4 months and was getting pretty desperate to get THE date! When it finally came, it was quite the deception. My interview was set for Tuesday, October 28 at 2pm in Chatsworth, CA. Not only were we going to be far from there but on top of it, we didn't even have a car to get there anymore!!! I went by the office and tried to convince them that I needed an earlier appointment but nothing would have made them change their minds. We decided that if we were to rent a car and make the trip anyway, we might as well make the most of it. We were up at 6am and ready to go on a last shopping spree before my appointment. Costco, walmart, West Marine.. We did them all! I was very nervous for my appointment of course, as I had heard that they could be very inquisitive! I knew the 100 questions for the civic test so now I just had to wait and see! We were thereat 1.30 and at 2 I was in an office with a very nice lady! Like I had suspected my case was fairly easy for them as there was no doubt that my relationship to my husband was real with a 2 year kiddo and one in the way! She reviewed the paperwork, asked me 6 (easy) civic questions, made me read and write a sentence and the deal was sealed. In less than 30 minutes, I had the anticipated paper that said "CONGRATULATION"!!!!! Now I have to wait to when and where will my oath ceremony will be. Often we are asked by friends, family, and others how we plan to "stay connected" while traveling. So today is a test of the full system and while anchored in San Diego there is readily available wifi and cellular service it is still important to fully test all of our systems before departing. The intent of this post is that it will travel from our laptop onboard, through a special USB modem which is connected to our SSB radio (more on what exactly all of this is later), which will then make a connection to a remote station over HAM radio frequencies that will receive this email and send it along its way on the internet to our blog which then posts a really cool link on facebook for everyone to read. On board we have what is called an SSB (Single Side Band) radio, this is a level well beyond the normal VHF radio which most people are familiar with. An SSB radio, and specifically a Marine SSB radio, is a special HAM radio which can be used to communicate over long distances supposedly up to and beyond 4000+ miles. I can confirm that this is mostly true as we were able to make a successful connection with a station in Hawaii a couple of nights ago. You may wonder how this works exactly, unfortunately I cannot really answer that at this time, I am told that it bounces these radio signals off the ionosphere and that specific frequencies have specific bounce distances. All of which, of course, depends on the weather, other local interference sources, the size and number of current solar flares and whether or not someone just flushed the toilet at the Sheraton across the harbor from us. All I really know for sure is how much power this thing draws to do all of this and it is not a trivial amount. The next part of this puzzle is the Pactor modem, a special device which is used to convert digital data into analog signals that can be sent as audio over the SSB radio to a receiving station on the other end who then processes it and sends it along its way. I don't really know a lot about this thing, and in fact I'm not sure anyone does as it is made by a German company who is the only known company on the planet to make such a device and apparently they own some type of global patent on the technology which prevents anyone from copying it or knowing much about it. Now talking about powering all of this high powered technology. We have four solar panels totaling 650 watts and a 400 Watt wind generator. In theory on a nice sunny clear day we can generate a few Kilowatts of power, in practical usage we see have been seeing about 2KWs per day from our solar array and an unknown amount from the wind generator (it has not been very windy in San Diego since we got here). All of this gets dumped into a battery bank of around 650Ah of capacity which powers everything from the freezer to the SSB radio. This may make it seem like we have a lot of energy to throw around but we are still quite limited in capacity and have to be especially vigilant about turning things off, something that takes a little getting used to coming from a land based residence where you have essentially unlimited amounts of power. Well, that's about it for today. Check back for more updates about the rest of the interesting technology goodies we have onboard. Our sailor friends had warned us that boat cards would be a necessity once we were full time cruisers. Boat cards are like business cards but for cruisers. It shows all the info necessary so others can contact you easily and remember who you are. After talking with other cruisers, we decided that we wanted to put enough information to be easily reachable but not too much so if our card is left on a table and a stranger find us, it wouldn't be an issue! Everybody had different opinion on what info should be on that card but one thing that everybody seemed to agree on was that the card should include the name of the boat and a picture of the crew. Once you go cruising, you become known by the name of your boat. We heard a couple of time when we went ashore, "oh look, Reprieve is here!" or "That's Grace from Reprieve!" Your boat's name almost become your last name! On the back we have a picture of the three of us with our names. We printed a 500 of them for almost nothing via Vistaprint with one of the many coupons you can find online! We left Channel Islands Harbor very early Sunday morning after a good night of sleep. The day was beautiful. Very calm sea with winds at about 10 knots. We were able to sail part of the day with the spinnaker and we motored the rest of the time. It was very relaxing. We divided the night in 6 hour shifts. I took the first shift from 10 to 2am. It was a fairly uneventful shift. I got to watch a couple of cruise ships and huge tankers illuminated like Christmas trees around us. None came close enough to be a threat though. Nathan reported that his shift was the same. We arrived around 7.30am and by 9 we were anchored and ready to explore San Diego! We found out that doing 6 hour shifts was what worked best for us, especially at night! Each of us are then able to get a decent amount of uninterrupted sleep. It was nice to be able to try our shift system knowing that we would be there the next morning and be able to rest if that didn't work out too well. Our first leg in the Baja Haha will have us sail for three days non-stop so having a system that works is a necessity. Our first day in San Diego was spent relaxing at the pool and taking a long dinghy ride around the harbor to give a better idea of what is where. the Cabrillo Isle Marina of San Diego is a sister marina of Anacapa Isle Marina in Oxnard, where we had our dock, therefore we are able to use all their facilities for the whole time we are here. Long hot showers and days at the pool here we come!! Yesterday was an interesting day for sure. Here we were with all those stores we wanted to go and no car!! I was sure that it would be my car I would miss the most when I left.. and I was RIGHT!!! We left at 1pm, found the right bus and then the right trolley. A LOT of walking, another trolley and 4 stores later, we were done with our errands. It was now 6.30pm, we were exhausted and hungry and poor Nathan couldn't feel his arms from carrying Grace and one very heavy bag. We found a fast food on the way to our last bus to get home and ordered hot food. It fell so great to sit down for a while. Little did we know that we would be back (running this time!!) in 10 minutes! You see, I decided to check the bus schedule to see how long we had until the next bus as I thought I had read that the buses were not as frequent in the evening. That's when I found out that there was a bus in 12 minutes and then non for the next HOUR! We packed our food, took our bags and RAN the three blocks to the bus stop. We even had the luxury to wait almost a full minute for the bus!!! We were home by 8pm with a bunch of new goodies and a good laugh at our adventures of the day! We baked some cookies that we ate in bed watching tv and called it a day! Grace had the blast the whole day and especially loved taking the bus and the trolley!! Today was a lot more relaxing. I guess it was too relaxing for Grace and she decided that it was time to GO! She untied the dinghy while I was making the bread and Nathan was busy something inside. She heard her squeaking and laughing so we went out just in time to see the dinghy floating away. Faster than I write this, Nathan was in the kayak on a mission to retrieve the dinghy! We got the message and decided to go for a stroll ashore! Thanks Grace!! It finally happened! We left. This morning was our last time running to keep to the schedule. We said bye to both cars, let go of the phones, bought some last minutes goodies that we still wanted, and tidied up the boat so she looked extra pretty for the party! At 1pm, family and friends came to wish us safe travels and say goodbye until next time. It was so much fun to show around our home. We got to explain what we did for water, how the potty works, what we had in our medical kit. We promised one last time that we would stay far from the pirates and would do our best to avoid any storms. We would like to thanks everybody who came and made it a great day! A huge thank you for all the thoughtful gifts also. It was all very appreciated! The party lasted a little longer than anticipated so we changed our sailing route some. Rather than stop in Marina Del Rey, Long Beach, and then to go to San Diego, we decided to get some rest and then go straight for San Diego! We are anticipating very flat sea and almost no wind. Some motoring might be in our future! We are very excited to get to San Diego and meet fellow sailors. Grace already has two playdates set up with other toddlers who live on boats too. I can’t wait to hear from the moms all the tips and tricks that they use to keep the kids happy while under sail. Our last week in the US should be pretty full. There are a couple of seminars and parties organized for the Baja Haha boats that we plan to attend and some errands we want to run while we still have access to quality goods especially when it comes to boat parts. But we are also planning on a lot of beach time where we can just sit, relax and watch Grace having a blast! Aujourd'hui c'est le jour J! C'est finalement arrivé! Nous sommes partis. Ce matin était notre dernier jour à courir pour respecter un horaire. Nous avons dit au revoir aux deux voitures, lâché les téléphones, on a fait les achats de dernière minute, et nous avons rangé le bateau qu’il ait l’air encore plus beau pour la fête! À 13h, la famille et des amis sont venus pour nous souhaiter bon voyage et dire au revoir jusqu'à la prochaine fois. C'était vraiment sympa de montrer notre nouveau chez nous. Nous avons eu le plaisir d’expliquer ce qu’on allait faire pour avoir de l’eau potable, comment les toilettes fonctionnent, ce que nous avions dans notre pharmacie portative, etc Nous avons promis une dernière fois que nous resterions loin des pirates et ferions de notre mieux pour éviter n'importe quelles tempêtes. Nous voudrions remercier toutes les personnes qui sont venues et qui ont fait de ce jour, un jour formidable! Un grand merci pour tous les cadeaux aussi. Ce fut très apprécié! La fête a duré un peu plus longtemps que prévu donc nous avons décidé de changer un petit peu notre route. Plutôt que d’arrêter à Marina Del Rey, Long Beach et ensuite d’aller à San Diego, nous avons décidé de nous reposer un peu et d’aller ensuite tout droit pour San Diego! La mer est censée être plate avec très peu de vent. Nous sommes très excite d’arriver à San Diego et de rencontrer d’autres marins. Grace a déjà deux rendez-vous avec d'autres enfants qui vivent sur des bateaux aussi. Je suis impatiente de rencontrer d’autres mamans et d’entendre leurs trucs et astuces pour garder les enfants heureux et en sécurité tandis qu’ils sont entrain de naviquer. Notre dernière semaine aux Etats-Unis devrait être assez bien remplie. Il y a deux ou trois séminaires et fêtes organisés pour la flotte Baja Haha auxquels nous aimerions assister et à quelques dernières commissions que nous voulons faire tandis que nous avons toujours accès aux marchandises de bonne qualité particulièrement lorsqu'il s'agit d’outils pour le bateau. Mais nous espérons aussi passer beaucoup de temps à la plage où nous pouvons juste nous détendre et observer Grace s’amuser! In a week we are supposed to be headed off to joing the HAHA fleet in San Diego, so what have we done and what are we doing? Well the list of improvements to S/V Reprieve are quite extensive and infact at this point I think I would be challenged to list them all. 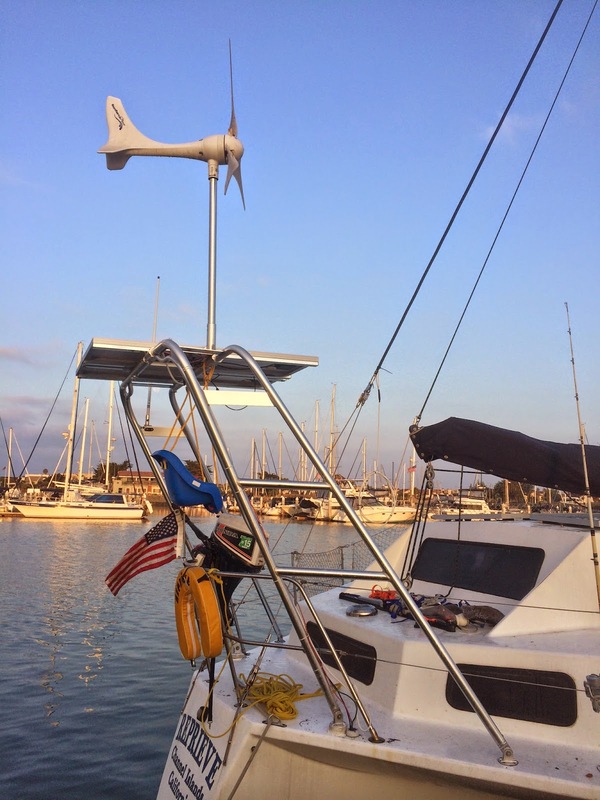 The last month has been exhausting, from assembling and mounting a beautiful arch with new solar panels and various other accessories to repainting the bilge and wiring in new electrical panels and gadgets of all sorts. From all of this there are two things I know for certain, first is that there is no such thing as finished and no such thing as only doing it once (ok that's really two) there are a number of things which after the initial installation I simply didn't like and re-did or which were simply put in place in a temporary way so as to be able to install something else or to move something out of the way. The second is that any sailor, cruiser, or other individual who owns and maintans a boat is less so a sailor and more so a variety of other professions. So far on our list on board we have a mechanic, a plumber, an electrician, a carpenter, a painter, a sail maker, a canvas maker, a rigger, a fiberglass fabricator, a medic, a chef, a daddy, a mommy, and somewhere in all of that I'm hoping we remember how to sail this darn boat. And to be totally honest I'm not sure where all these people are sleeping but maybe that's why even a 38ft trimaran can seem crowded at times. To the left is our brand new 120% Genoa that we assembled ourselves from a sailrite kit. 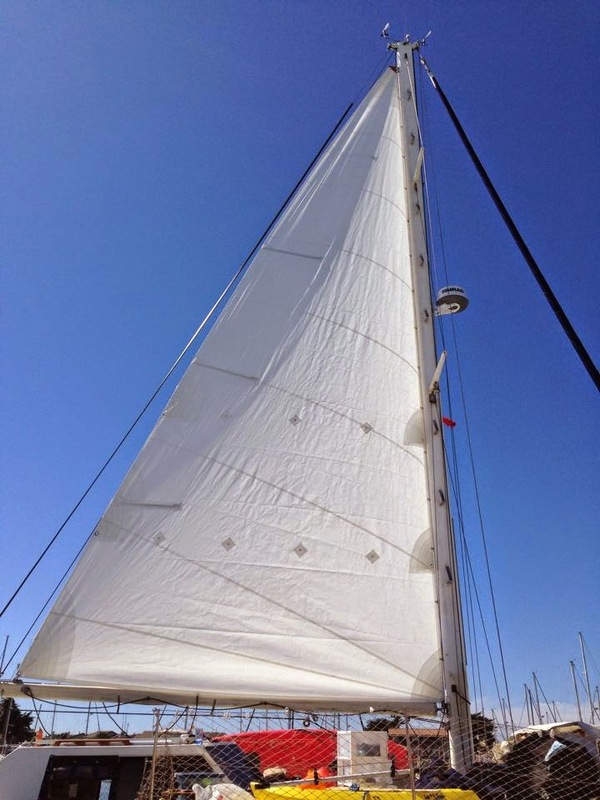 It is quite the upgrade from our previous headsail which wasn't quite a proper fit for the boat, the foot was a little bit too high, the head was a little bit too short and it only came to about a 100%, maybe 105%. In total I believe we spent about 30 hours assembling this. We have spent a lot of time lately going up the mast installing new wind instruments, running cables, installing the radar and sometimes just to take measurements. Needless to say our little monkey was getting a bit jealous and just HAD to try out the bosun's chair for herself. Our new main sail which we spent maybe 24 hours or so assembling, unfortunately we cannot take credit for the entire thing as we did solicit some help from a local sail loft to finish the sail as we simply ran out of time and had too many projects to finish. We can, however, take credit for the entire assembly, the patches, reef points and the leech line. I can also take credit for not putting in the top batten property which decided to go for a swim the first time up (remember where I said a lot of things get done twice?). Like the head sail the former main sail was not quite optimal, it was a bit baggy in the middle, a bit too short at the head and a bit too short along the boom. We're hoping to seem some nice improvements from these two new sails. The old ones will be stowed to use as emergency backups. Our awesome arch which was custom built and shipped to us from Atlantic Towers. We have a set of Davit's to install which will carry our dinghy on shorter passages but I had been waiting to tackle a slight alignment issue as previous to this picture it was tilted a little further back since we did not cut and adjust the legs completely before assembly. After a week or so of thinking and trying to figure out how to fix it it was easy enough to cut out two HDPE pads (1.5" thick) with a hole saw and place them under the stern legs of the arch to lift it up and level it out. As for upcoming things, we still have to wire in the SSB radio and setup our pactor modem, we need to finish up our water maker installation and finish stowing and storing things on board. We also have new flooring to put in and once we get down to mexico we will be building a stern scoop and swim step while we are hauled out for some paint work. Dans une semaine, nous sommes censés joindre la flotte du Baja Haha à San Diego, donc qu’est-ce que nous avons fait et que faisons-nous là? Eh bien la liste des améliorations de Reprieve est assez vaste et en fait à ce point, je pense que je serais mis au défi de les énumérer tous. Le mois dernier a été épuisante, de l'assemblage et le montage d'une belle arche avec de nouveaux panneaux solaires et divers autres accessoires à repeindre la cale, et le câblage des nouveaux panneaux et gadgets électriques de toutes sortes. De tout cela, il y a deux choses que je sais avec certitude. La première est qu'il n’existe pas une telle chose comme un bateau fini et que rien n’est fini à la première installation. (ok c’est vraiment deux) Il y a un certain nombre de choses qui, après l'installation initiale, on aimait tout simplement pas et on a refait, ou qui avaient été tout simplement mis en place de manière temporaire afin d'être en mesure d'installer d’autre chose ou pour déplacer quelque chose d’autre. La seconde est que n’importe quel marin, ou personne qui possède et maintiens un bateau est moins un marin et d'autant plus une variété d'autres professions. Jusqu'à présent sur notre liste à bord nous avons un mécanicien, un plombier, un électricien, un menuisier, un peintre, un fabricant de voile, un fabricant de toile, un installateur, un fabricant de fibre de verre, un infirmier, un chef, un papa, une maman et quelque part dans tout cela j’espère nous nous souvenons comment naviguer ce bateau aussi. Et pour être tout à fait honnête, je ne sais pas où tous ces gens dorment mais peut-être que c’est pourquoi même un trimaran de 38 pieds peut sembler parfois bondé. Sur la gauche est notre tout nouveau 120% genoa que nous avons assemblés à partir d'un kit de Sailrite. C’est définitivement une modernisation car la voile que nous avions avant n’était pas du tout ajustée pour notre bateau, le pied était un peu trop élevé, la tête était un peu trop courte et elle n’était qu’à environ 100%, peut-être 105 %. Au total, je crois que nous avons passé environ 30 heures à assembler la nouvelle voile. Nous avons passé beaucoup de temps dernièrement à monter au mât pour installer de nouveaux instruments à vent, passer des câbles, installer le radar et parfois juste pour prendre des mesures. Inutile de dire que notre petit singe était un peu jaloux et a du essayer la chaise du maître d'équipage par elle-même. Notre nouvelle voile principale nous a pris a peu près 24 heures d'assemblage, malheureusement nous ne pouvons pas prendre le crédit pour l'ensemble de la voile car nous avons sollicité l'aide d'une voilerie locale pour terminer la voile car nous avons tout simplement manqué de temps et avions trop de projets à terminer. Comme la voile genoa, l'ancienne voile principale était pas tout à fait optimale, c’était un peu trop grand au milieu, un peu trop court à la tête et un peu trop court le long de la rampe. Nous espérons voir de belles améliorations de performances avec ces deux nouvelles voiles. Les anciens seront rangés à utiliser en cas d'urgence. Notre arche personnalisée a été construite et livrée par Atlantic Towers. Nous avons un ensemble de Davit à installer qui portera notre canot pneumatique sur les passages plus courts. On October 1, we became officially homeless. Or should I say houseless?! We do still have a home but it sure is not what most people have in mind. Last weekend, we went through a lot of different feelings: excitement, fear, nostalgia. The days were very long and sleep was almost nonexistent but we finally made it! Every last piece of furniture was sold or donated and the whole house was cleaned. Getting rid of all the junk that can clutter a house is a daunting task but when you actually begin the process, it’s liberating and almost thrilling! Our goal was to get rid of all the furniture and to keep no more than 3 boxes in a relative’s attic. In reality, we ended keeping the crib (purely because of the feelings attached to it!) and store it in the attic and 4 boxes plus my wedding dress joined it in there! I would say that we are close enough to call it a success! Not having to pay for a storage unit was the ultimate goal. When you begin a new adventure which can change the rest of your life, you go through a whole array of feelings: doubts, fear and excitement being the biggest one for me. It is one thing to change your own lifestyle; it is something very different to make that change for your entire family! It took me a while of researching on the internet and talking with different families before I was entirely convinced that I wasn’t just selfish to take my daughter on such a journey and to think that she would truly beneficiate from it. Like all new adventures, there is always so healthy dose of fear. In our case, we were able to channel that fear to make us even more prepared! What if somebody get really hurt? Let’s take an advanced first aid class and have a fully stock medical kit. What if we get caught in a storm? Let’s learn as much as we can about weather systems and weather prediction, and make sure that the boat will be ready to handle a storm if we were to be caught in one. What if Grace gets bored or has a hard time adapting? Let’s make her a playroom, decorate her bedroom and make it fun. You get the idea! As for the excitement, well I don’t think there is much to say about that! It is a common project that we have talked about almost since the day we met! It took careful planning and conscious every day decision but it is finally there!! Wednesday was our first night on the boat as fulltime live aboard and it was glorious! We had boxes everywhere and could barely walk through but it didn’t matter because we were home!! We had a simple dinner with mama’s famous homemade spaghetti sauce, we gazed at the boat around us, watched a movie and went right to bed. Exhausted from the hard work but as happy as can be! Le jour est finalement arrivée!!!! Le 1er Octobre, nous sommes officiellement devenus sans-abri. Ou devrais-je dire sans maison?! Nous avons toujours un « chez-nous », mais ce n’est pas le genre de chez-nous que les gens imaginent pour sûr! Le week-end dernier nous sommes passés par beaucoup d’émotions différentes: l'excitation, la peur, la nostalgie... Les journées étaient très longues et le sommeil était presque inexistant mais nous l’avons finalement fait! Chaque meuble a été vendu ou donné et toute la maison a été nettoyée. Se débarrasser de tous le surplus que peut encombrer une maison est une tâche ardue, mais quand vous commencez finalement le processus, c’est libérateur et presque palpitante! Notre objectif était de se débarrasser de tout le mobilier et de ne garder pas plus de trois boîtes dans le grenier d'un parent. En réalité, nous avons aussi gardé le lit cage (uniquement en raison de sentiments attachés à lui!) et nous l’avons stocké dans le grenier avec 4 boîtes ainsi que ma robe de mariée! Je dirais que ce fut un succès! Ne pas avoir à payer pour une unité de stockage était le but ultime. Lorsque vous commencez une nouvelle aventure qui peut changer le reste de votre vie, vous passez par toute une gamme de sentiments: doutes, la peur et l'excitation étaient les plus fort pour moi. C’est une chose de changer votre style de vie; c’est quelque chose de très différent de faire ce changement pour toute votre famille! Il m'a fallu un certain temps, des recherches sur Internet, et beaucoup de temps à parler avec d’autres familles qui l’ont fait avant d’être tout à fait convaincue que je n’étais pas juste égoïste de prendre ma fille pour un tel voyage et de penser qu'elle en bénéficierai elle aussi. Comme toutes les nouvelles aventures, il y a toujours une dose de peur. Dans notre cas, nous avons réussi à canaliser cette peur pour nous sentir encore plus prêt! Et quelqu'un se fait vraiment mal? Prenons un premier cours de secourisme avancé et ayons une trousse médicale bien stockée. Que faire si nous sommes pris dans une tempête? Apprenons autant que possible sur les systèmes météorologiques et les prévisions météorologiques, et assurons-nous que le bateau sera prêt à gérer une tempête si nous devions être pris dans une. Que faire si Grace s’ennuie ou a du mal à s’adapter? Faisons lui une salle de jeux, décorons sa chambre et faisons en sorte qu’elle s’amuse. Vous avez l'idée! Quant à l'excitation, je ne pense pas qu'il y ait beaucoup à dire à ce sujet! C’est un projet commun dont nous avons parlé presque depuis le jour où nous nous sommes rencontrés! Il a fallu une planification soigneuse et des décisions journalières, mais c’est finalement là!! Mercredi fut notre première nuit sur le bateau à vivre là à temps plein et c’était génial! Nous avions des boîtes partout et on pouvait à peine marcher d’un bout à l’autre, mais ça n'a pas d'importance parce que nous étions chez-nous!! Nous avons eu un dîner simple avec la fameuse sauce à spaghetti maison de maman, nous avons regardé un film et nous sommes allés droit au lit. Épuisé par le travail acharné, mais aussi heureux que possible!